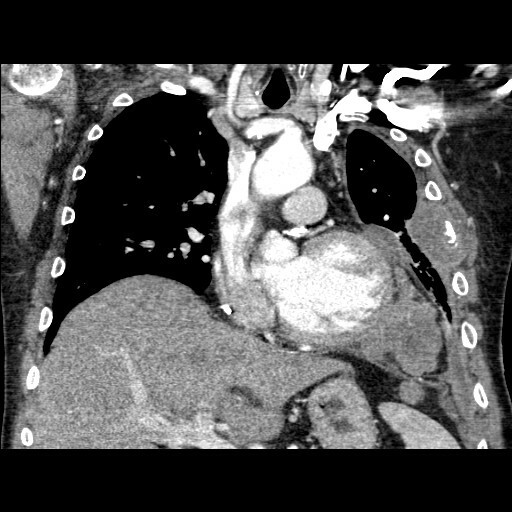 History: 60 year old male with left sided chest pain. Coronal contrast enhanced CT of the thorax shows a large lobulated soft tissue mass within the left lower hemithorax which invades the diaphragm to enter the abdomen. Also note the large soft tissue mass which invades the left lateral fifth rib. 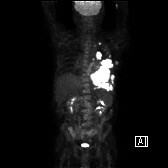 Maximum intensity projection (MIP) of an F18 FDG-PET/CT scan shows the large left hemithorax mass which has marked FDG uptake. Multiple other lesions with avid uptake are seen, concerning for metastatic disease. This is a case of pathology proven metastatic malignant mesothelioma. These are tumors of the pleura, and are most likely secondary to long-term asbestos exposure, in which there is a dose-response relationship and typically a latent period of 30-45 years. Asbestos plaques are not a precursor to malignant mesothelioma. While the aggressiveness of this particularly mass makes malignant mesothelioma the likely diagnosis, the differential includes metastatic adenocarcinoma, empyema, malignant thymoma, splenosis, and lymphoma. Its very easy. Just go to wordpress.com and peruse the help section and go from there.